This blend is a treasure for connoisseurs, produced according to a traditional recipe. 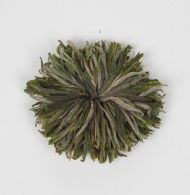 This particularly fine Yunnan black tea is long golden tips by hand tied in small pagodas. The cup is bright golden brown and the aroma sweet and soft earthy-berry with a subtle touch. This cranberry already starts being merry in the fall, beginning to quietly ring the festive bell. Not too much, but just a little dash of eggnog, in combination with autumnal, fruity-tangy flavours. Bright red cranberry slices, cinnamon rods and star aniseed sweeten the darker getting evenings. Why not already chance a hidden kiss underneath the mistletoe? Ingredients: cranberry slices (cranberries, sugar), apple cubes, mistletoe, star aniseed, cinnamon rods, flavouring, blackberry leaves, freeze-dried cranberry slices, safflower. Ingredients: cranberry slices (cranberries, sugar, vegetable oil), apple cubes, Mistletoe, star aniseed, cinnamon rods, flavouring, blackberry leaves, safflower, freeze-dried cranberry slices. The ginger is one of the most widely known herbs and spices. Its roots yield the unique, highly aromatic, sweetly spicy flavour. Ginger has been valued and used by various cultures for centuries. We can also no longer imagine life without it in our hemisphere. The root of the ginger, the so-called Rhizome, which grows horizontally, entwined in the soil, is harvested. Enjoy our high quality ginger pure, with honey or as a flavour-giving ingredient to one of our tea creations. A must-have!